Three-weight world champion Vasyl Lomachenko has highlighted Luke Campbell as the toughest assignment in the lightweight division after demolishing Anthony Crolla inside four rounds in Los Angeles. If Lomachenko does not fight Mikey Garcia, promoter Bob Arum will chase a bout against Campbell in London. Lomachenko defended his WBA and WBO lightweight belts on Friday night with a brutal stoppage of Crolla 58 seconds into round four. Lomachenko (13-1, 10 KOs) saw off the mandatory challenger for his WBA belt with ease, nearly ending it late in the third round knocking the British fighter into the ropes. 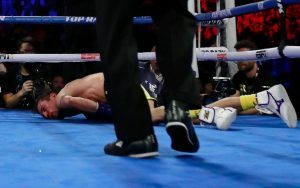 Referee Jack Reiss allowed the fight to continue, and Lomachenko finished it shortly after the break with a right hand that dropped Crolla face-first onto the canvas. 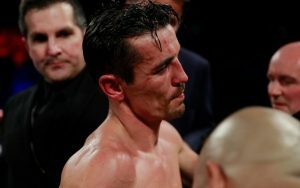 The Briton looked badly hurt, but Matchroom officials later confirmed that Crolla had suffered no broken nose or ribs, and had not been taken to hospital. He had been outclassed (34-7-3), Lomachenko having planned to take on Richard Commey in a three-belt unification fight, but an injury to Commey’s hand had forced this contest. Lomachenko is now turning his attentions to Campbell. “We are both Olympic champions from London 2012, and it would be a great fight,” he said. “I love the noise the British fans make and how much they love boxing.” Promoters Top Rank have already spoken to the O2 Arena about potential dates. Lomachenko headlined here at Staples Center for the first time in his brief professional career, and a raucous crowd of 10,101 filled the lower bowl for his biggest showcase yet. The Ukrainian has developed a significant fan base in the Los Angeles area, where he lives and trains. If a fight were to take place in the UK, Lomachenko’s return may well be treated as a homecoming. Lomachenko’s profile has grown exponentially in recent years after headlining at Madison Square Garden, in Macau and other Los Angeles-area venues before his step up to Staples. Lomachenko’s next fight is likely to be even bigger, whether as a unification bout or a showdown with one of the other lightweight greats of this era. In the co-main event, longtime super middleweight champion Gilberto ‘Zurdo’ Ramirez remained unbeaten when his light heavyweight debut against Tommy Karpency was stopped by Karpency’s corner before the fifth round. Ramirez could yet fight Callum Smith, ranked the No 1 in the super middleweight division, who was ringside for the contest.